Religion is dividing our country. The Republican Party has used its resources to promote intolerance based upon fundamental religious dogma. The so-called values voters make a mockery of a political system based upon broad representation and compromise. The political process can not be effective when one side takes a "winner takes all" view of politics. Personally, I have a growing HATRED for folks that claim to be Christians and act otherwise. Not only do these pretenders sully the name and message of Jesus, they often drive folks away from Christ. I was taught that anything that does not INVITE you to Christ is not of God. Anti-Gay rhetoric is among the most foulest of crap spewed by Christianists. The recent remarks made by a Barack Obama supporter illustrate the not so subtle anti-gay message that is too often promoted. The Rev. 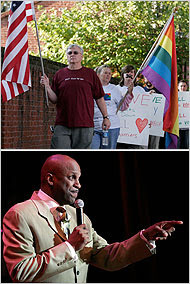 Donnie McClurkin's assertion, "God delivered me from homosexuality" is self-delusional. I don't doubt his sincerity. I do doubt his conclusions about whatever "revelation" he believes to have received. In time, we may see him repent. Unfortunately, Barack Obama has not handled this little controversy well. But, what the heck. Our friends and family often embarrass us with outbursts of idiocies. In time, Obama will find the right voice on this issue and may be more careful with whom he offers and accepts support. Unfortunately, I also feel unconstrained to speak out about what seems like a flaw in the thinking of some African American political activists. Much to my chagrin I have met too many African American's that don't connect their anti-gay religious views and actions with the LGBT struggle for basic human rights. I still remain saddened by the fact that many so-called MEA leaders just don't get it. BRING THE TROOPS HOME the FRICK ALREADY! I don't see ANY of these things happening with a Republican president. Even Guiliani claims God is on "his side" (I shall refrain from judgement).